Ghostbus Tour: The Best Night Out in Dublin City - Book Now! too, buried deep in Dublin's gruesome past. Visit a medieval vault at Dublin Castle and a hidden city graveyard. The Ghostbus tour gives you a glimpse of Dublin’s underbelly, the dark side to “Dublin’s Fair City” you’ve never seen or ever knew existed. The Ghostbus storytellers bring tales from Dublin’s dark history to life and you’ll experience a crash course in the art of body snatching form the handbook of Dr Samuel Clossey himself as well as visiting the scenes of some of Dublin’s most horrific and shocking paranormal activities, including a hidden city centre graveyard and the medieval vaults that lie beneath Dublin Castle. Your Ghostbus ordeal begins as soon as you get on board. First make your way through a series of sinister, maze like chambers, and then mount the steps to the Victorian theatre above, the scene of the night’s events. Blood red velvet curtains enclose the space and suppress the screams from within as the tour takes off. The Ghostbus Tour Storytellers are professional actors who strike a perfect balance between comedy and horror. They throw themselves into their dark roles to the point that it’s sometimes hard to know if they are still acting! We are the world’s first Ghostbus Tour, and although the idea has been copied in many cities around the world now, we remain the original and the best. 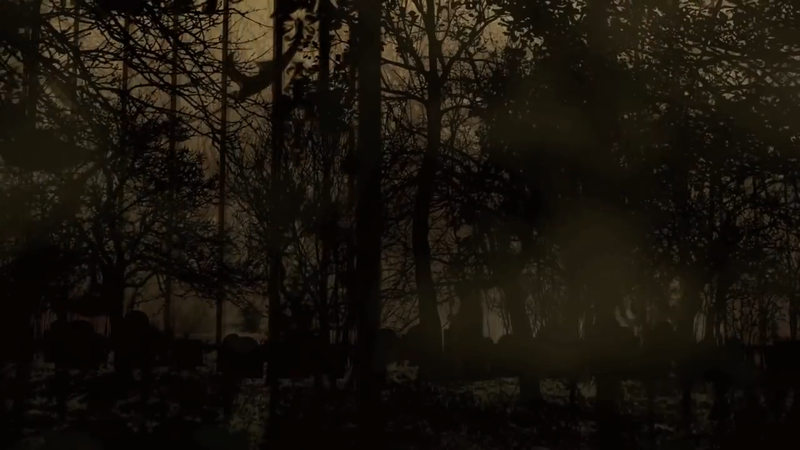 We’ve spent years perfecting our tour of all things dark and ghoulish in Dublin. In 2016 we introduced two new buses, equipped with all kinds of new scary gadgetry, and hidden passageways. 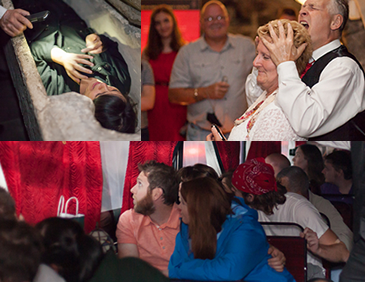 With new sound and lighting effects too, the new look Ghostbus tour always delivers a terrifying ride! The Ghostbus tour caters for everyone, whether you’re out with friends, on a first date, hen parties, office nights out, birthday or Christmas bashes and we’re also available for private hire. Whether ghosts or ghouls are your thing, or you want a laugh and a night of frightening stories we guarantee a great night out. So discover a new (and alcohol free!) 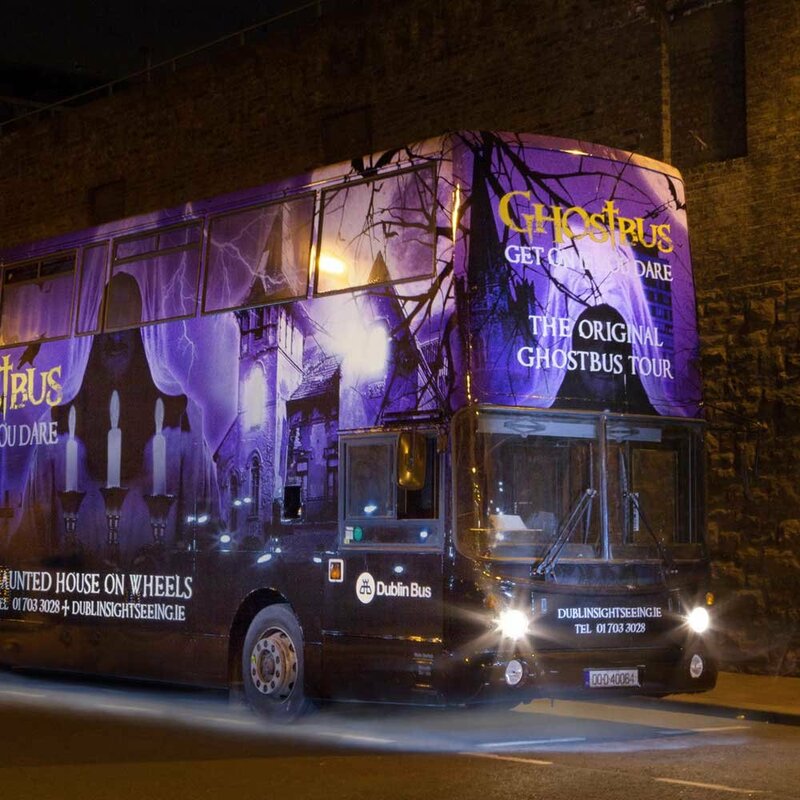 side of Dublin and have a night you’ll never forget … on the Dublin Ghostbus Tour. I was literally scared the entire time. Great fun and really spooky! From sinister surgeons and body snatchers to ghosts and ghouls, there is no better way to discover Dublin's dark side. Visit the medieval vault in Dublin Castle, the eerie urban graveyard, and discover Dracula's Dublin origins while enjoying a spine-tingling live performance on the world's first ghostbus. The Ghostbus Tour contains irreverent humour and scenes with adult content/language. It is not suitable for persons under the age of 14 and those who are offended by irreverent humour and scenes alluding to adult themes.. This tour is not wheelchair accessible. Please arrive 15 minutes before the tour departure. The Ghostbus Tour takes place in all weather conditions. Please dress appropriately. If Dublin Castle is not available an alternative venue will be used. Strobe lighting is used during the tour.